We are going to share a Seder Passover meal with a family. Here is the table, all laid and ready and now, one by one, the special Seder foods arrive. Each food reminds us of the Exodus when the Moses “led the Jewish people out of slavery to freedom. We begin with matzo crackers and wine. Soon after this there is a jug of salt water and a roasted egg. One by one more and more items are brought to the table until it is quite covered with glasses, plates of food, and the other items that are traditional for this feast day. A lilting rhyme written in the style of “This is the house that Jack built” gains momentum as more and more things are added to the table. Finally, on the last double-page spread, the entire family is shown seated at the table reading from their Haggadahs with glasses of wine raised. 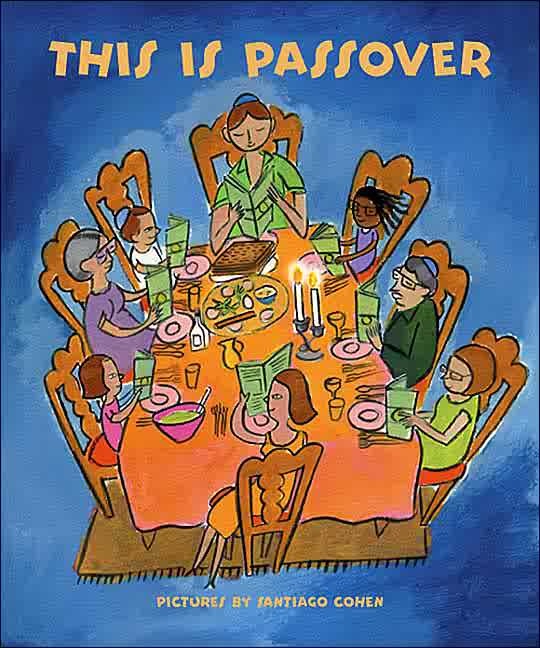 This cheerful board book will give children a wonderful introduction to the traditions and rituals of the Passover feast.